Pre Engineered Building. We Sahjanand Infratech is the leading manufacturer of Pre Engineered Building and EOT Crane in Vadodara. Pre Engineered Building erection work in horizon industrial park near karjan. PEB Structure is light in weight and best in look. Quality of JSW Sheet. - JSW Colouron sheet manufactured by Anti - Corrosion Technology which prevents corrosion of steel and increase the life of roof. - JSW Colouron sheet sustain in all weather like heavy rain, salty sea area, humidity area or cold snow area. - JSW Colouron sheet manufactured from pure steel with light weight and high tensile strength of 550 - 770 MPA. We are the leading manufacturer of Pre Engineered Buulding, PEB Structure & EOT Crane in Vadodara, Gujarat. Pre Engineered Building Manufacturer in Vadodara, Gujarat. Here we shown our latest project of vadodara. Pre Engineered building is more convenient and cheaper then the Conventional Building. Look wise Pre Engineered building looks batter then conventional building. Pre engineered Building is lighter in weight as compare to conventional building. We are the leading manufacturer and supplier of Pre Engineered building and PEB Structure in Vadodara, Surat, Gandhidham, Dahej, Mehsana and allover India. Roofing Sheet work in Pre Engineered Buildibg. Here in the image we show the roofing sheet, Polycatbonate sheet and Turbo ventilator. Sheet are fitted on the Purlings by screw. All sheet are of JSW Make 0.47 thickness and color coated or bare galvelium. Pre Engineered building or PEB structure are light in weight and easy to fit and batter look then conventional building. 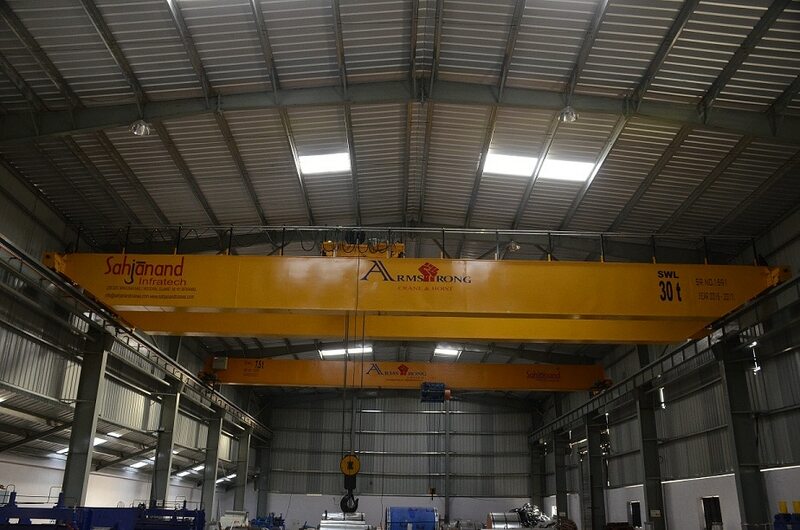 We sahjanand infratech are the leading manufacturer of Pre Engineered building and EOT Crane in Vadodara.